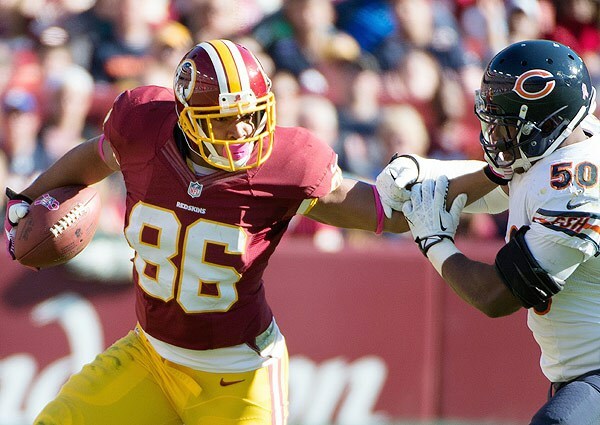 Change to the top five this month with Redskins tight end Jordan Reed entering at number five. Reed’s stock is up thanks to new coach Jay Gruden’s pass-first mentality. The four before him include Jimmy Graham, Rob Gronkowski, Julius Thomas, and Jordan Cameron. Up this month is Cowboys tight end Gavin Escobar and Titans tight end Delanie Walker. Escobar should see more opportunities in Dallas with Jason Witten getting older. Delanie Walker is expected to see more targets in new coach Ken Whisenhunt’s offense. Walker is a decent buy-low candidate for 2014. Lions tight end Joseph Fauria dropped a bit thanks to the Lions re-signing of fellow tight end Brandon Pettigrew. Fauria should pass Pettigrew on the depth chart sometime this season. The other drop is Tampa’s new tight end Brandon Myers. Myers had a terrible stint in New York and isn’t expected to do much better in Tampa. Even at 39 he’s not a recommended buy. This entry was posted in General and tagged brandon myers, delanie walker, gavin escobar, jimmy graham, jordan cameron, jordan reed, joseph fauria, julius thomas, rob gronkowski, updated dynasty tight end rankings. Bookmark the permalink.